Some are our own inventions, others good ideas we learned about from others. We began by making parts we needed for restorations - roller hooks, gripper arms and the like. We began having new cast iron parts made at a foundry run by an Amish farmer in Lancaster County, PA., and the finish machining done by a local machine shop. The cost of machining these parts has slowed down production a bit, but they are still getting done. 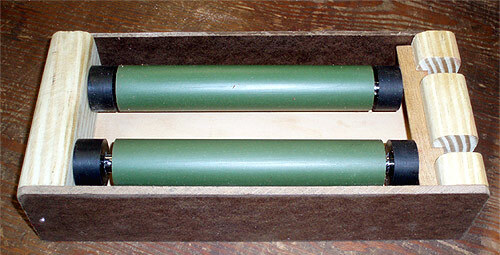 We cast our own 20-durometer rubber ink rollers. We make roller trucks in any size. We modify outsourced springs as replacements for other springs as needed. We make grippers for all small presses. We stock Kelsey grippers. We "make" galley press roller bearers of the same material. 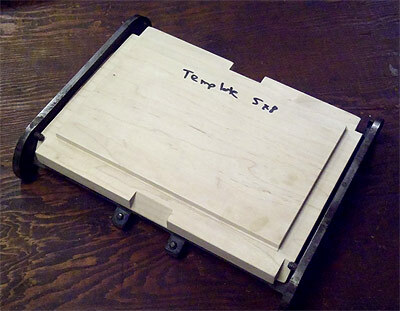 We invented and make a paper clamp system for galley proof presses. 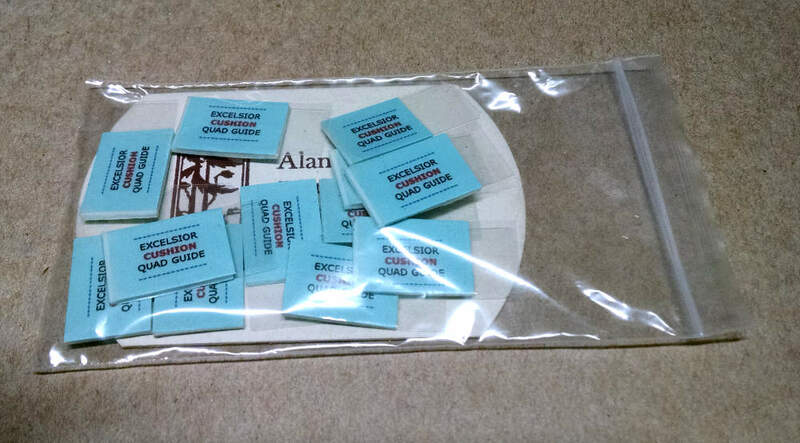 We make Galley Magnets of our own design. We make up kits of new and used leads and slugs - again, cut to precise length on our Hammond Glider Trim Saw. We make up kits of wood furniture - some new wood, some recycled furniture from old print shops. 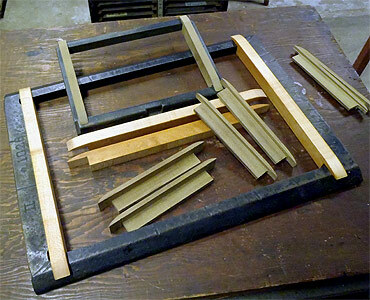 We recycle the old wood furniture by cutting each used piece to the next shorter length on our Hammond Glider Trim Saw. This gives each piece a true, square end, cut precisely - within one point - to any length required. We make The Excelsior Cushion Quad Guides. We make our own Wickersham Quoin Key. 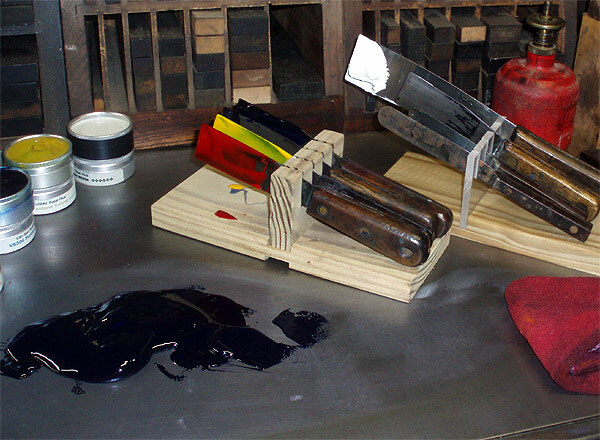 We make a holder for ink knives - to keep them clean as you are mixing inks. And, when there's time, we make coasters, posters, cards, die cut and number on any of a dozen hand presses and the auto-feed Heidelberg Windmill. However, even the things that we feel we have invented, may not be original. 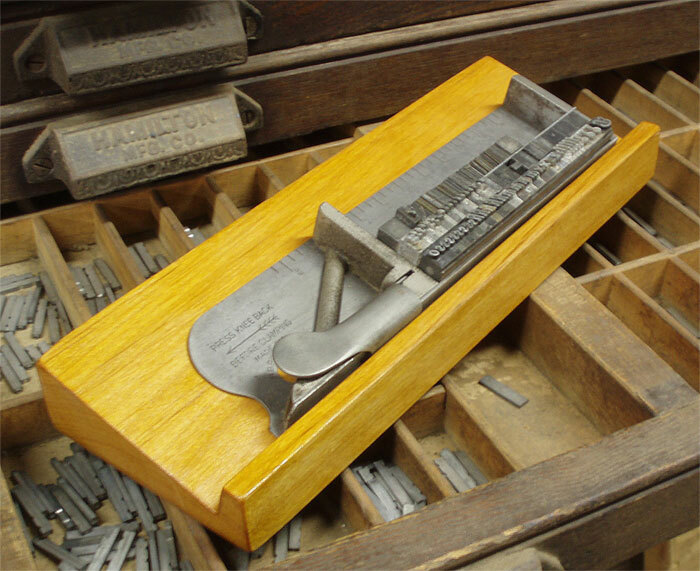 I recently discovered, for example, that more than ten years ago, someone in England came up with a very similar solution to mine to deal with the fact that many galley proof presses have no way to hold a sheet in position. The semi-automatic inking system we are currently developing for galley proof presses will revolutionize their use. Instead of spending 20 or more seconds setting roller bearers and hand-inking a form with a clumsy brayer, our system rolls two wide rollers right down the rails - and an oscillating parent roller keeps a nice film of ink available for each print. 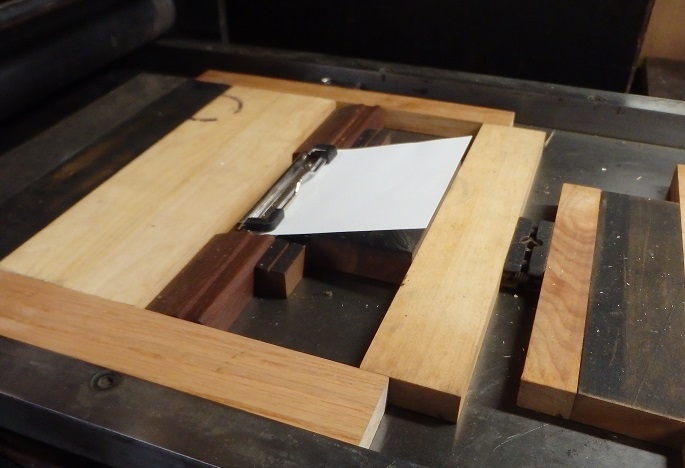 We make a platen leveling kit consisting of 4 Ludlow slugs - "X-x" that can be placed in each corner of a chase to make leveling a platen a far, far simpler task than using a lollipop - even a compound lollipop. We also make a photo-polymer version that works the same way, but mounts on a plate base. - and a Bridgeport Milling Machine - which is still across the road in the old barn. A Lincoln AC-225 Arc Welder - still to be wired up and used..
And, for the wood stove, we have tons and tons of wood down all around the property - piles cut to size, whole trees just waiting to be cut up. Yes, we have wood... and we use it. And, we have clutter - too much stuff in too little space. We want to build a barn, but that's a big and very expensive project. Still, it's high on the list!